Early August, house owners in some neighbourhoods of Bengaluru woke up to find they may soon not have a roof over their heads. They were gripped by panic. The Bruhat Bengaluru Mahanagara Palike (BBMP) had initiated the drive against storm water drain (SWD) encroachers. On the first day of the drive, buildings were demolished in more than 32 locations in Bommanahalli, Mahadevapura and Yelahanka zones. Emotions ran high at the demolition sites. House owners were seen pleading the BBMP officials to grant them extra time to vacate, while some of them even got into an argument. It was a disturbing sight where the houses built with hard-earned money were razed to the ground. Pradeep Rao, a tea vendor who built a modest house at Avani Sringeri near Kodichikkanahalli 15 years ago, was devastated to witness his house demolished right before his eyes. On the same day, at Shubh Enclave – a plush layout on Haraluru road, the BBMP demolished around 10 structures that were allegedly built on storm water drains. Shubh Enclave is located in an area between Kasavanahalli and Kaikondarahalli lake and is built on primary and tertiary storm water drains, according to BBMP officials. In almost all the SWD encroachment demolition cases that have taken place in last few days, a pertinent question that some residents have been asking is – how can the BBMP demolish structures when the authorities have issued us the Khata, plan sanction for the projects, and even nationalised banks have sanctioned loans? Take the case of Pradeep Rao at Avani Sringeri Layout or that of Mahendra Kumar at Shubh Enclave. Both of them, like many other residents who have lost their property during the demolition drive, claim to have obtained A Khata from the BBMP, plan sanction from the BDA and city corporation and have got the loans sanctioned from nationalised banks. “When we built this house we had no idea that it was built on a rajakaluve. We have the building plan sanction, A Khata and an Andhra Bank loan of Rs 4 lakh. BBMP officials and staff used to come to survey the SWD in last few years. But they would assure that SWD doesn’t pass through our property, hence we didn’t bother much,” Pradeep says. However, in the case of Shubh Enclave, though the residents had obtained necessary permission from the authorities, some of them bought the property with the full knowledge of the storm water drain flowing through the plot. According to some of the residents of Shubh Enclave Citizen Matters spoke to, the BBMP initiated the survey of encroached rajakaluve at Shubh Enclave in 2010. “A few house owners brought a stay from the High Court and every time when the BBMP would do the survey and come with bulldozers, the house owners used to produce the stay order. I don’t know if the residents who bought property before 2010 knew about Rajakaluve encroachment or not. But those who bought it after 2010 when the BBMP began the survey and marked the encroached area, certainly knew about the issue, yet turned a blind eye,” says a source who did not wish to be named. In fact, a local NGO Mahadevapura Parisara Samrakshane Mattu Abhivruddhi Samiti (MAPSAS) had taken the issue of missing storm water drain between Kaikondarahalli and Kasavanahalli lakes, to the Upa Lokayukta. A house in Shubh Enclave which belonged to Michael Ruthnaswamy till few months ago, was demolished during the recent encroachment clearance drive. Michael is lucky, for he sold the property to a builder last year and shifted to HSR Layout. He says he knew that trouble was in the offing ever since the BBMP began surveying the property in 2010. “I moved to the High Court and brought a stay order and prevented BBMP from demolishing the house. Last year a builder came forward to buy my property. He bought it with full knowledge of the storm water drain issue. He insisted that I vacate the court stay and he would handle the issue. So I got the stay vacated before selling the property,” he says. So what gave the builder the confidence to buy the property fully aware of the consequences? The answer is an open secret. How did people get documents in place? Despite the encroachment, the house owners in most of the cases have succeeded to get the documents for their property and house. Then why and how did things go wrong? A resident of Kaikondarahalli area and Founding Trustee of MAPSAS, Priya Ramasubban says when she had planned to a buy a plot near Kaikondarahalli Lake back in 2002, agents and lawyers dealing with land knew of sites that had issues. An officer from BBMP too made a similar point. Speaking to Citizen Matters, a BBMP Assistant Executive Engineer said that plan sanctions and Khatas obtained by house owners could be fake. “Residents or the developers must have bribed the officials to get things done,” he says. He gives his own example of buying a property in Bengaluru. “I know quite well that half the properties in Bengaluru are mired in controversies. So before buying a site, I checked almost 50 properties and all of them had one or the other problem with documents,” he points out. The flaw lies in the BBMP not cross-verifying the village map to identify whether a storm water drain runs through the property, while sanctioning the house plan or while issuing Khatas. In one document uploaded on the BBMP website, BBMP says the list of documents needed for plan sanction includes land conversion copy, change of land use document, revenue sketch, title deed etc. An FAQ uploaded on the same BBMP website, however, doesn’t mention these documents. Revenue sketch (tippani) is the document issued by the Survey department. Tippani shows sketch of the land based on the records of the Survey department. If at all BBMP had really insisted for producing revenue sketch during building plan sanction, it would have helped the corporation to figure out encroachment. Because, the revenue sketch reflects the forest, nala, buffer etc. But the BBMP doesn’t insist on this while sanctioning plans, says a BBMP official, on condition of anonymity. Thus, neither the village maps done in 1900s or 1960s, nor the BDA RMP is taken into consideration while sanctioning plans. 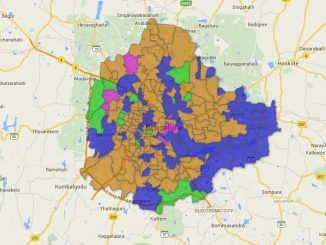 BDA’s RMP maps and bylaws etc have been shared extensively on the BBMP website, but there does not seem to be a mechanism to ensure mandatory submission of the documents or proper spot inspection. Things seem to be murkier as one digs deeper into the issue of rajakaluve encroachments in Bengaluru. While officials, developers and buyers are largely blamed for their role in the encroachment mess, there are certain technical flaws in the system which has over the years enabled encroachment of SWD across the city. The next part of the story will focus on the root cause of the encroachment problem. How did storm water drain encroachment happen over the years? What were the ambiguities in the survey system? 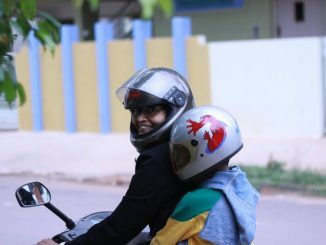 If you want to ride pillion in Bengaluru, don’t forget the helmet! Helmet for pillion riders are a must – again! Starting January 12th, you need it if you want to travel in a two-wheeler in Bengaluru. Some frequently asked questions on the new rule. Know more about your zones, wards and candidates, complaints, news — all in one place! This is your go-to page for the BBMP elections 2015.